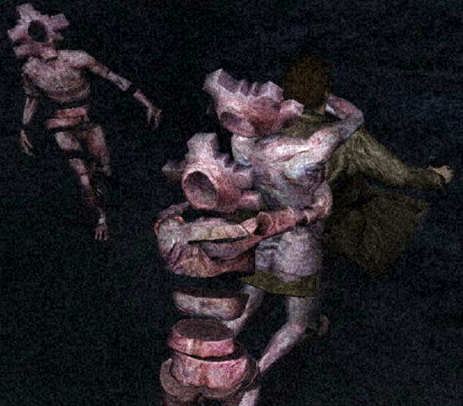 The Raw Shock is the only hostile monster encountered in Silent Hill: Shattered Memories. They pursue Harry Mason during each nightmare sequence, and only appear during Ice World transitions. As the game progresses, and based on the actions and decisions made by the player, the Raw Shocks will physically change to resemble the player’s psyche. This is similar to how Pyramid Head is born from James Sunderland’s mind inSilent Hill 2, and how the monsters in each Silent Hill game represent various emotional traits of the series’ characters. 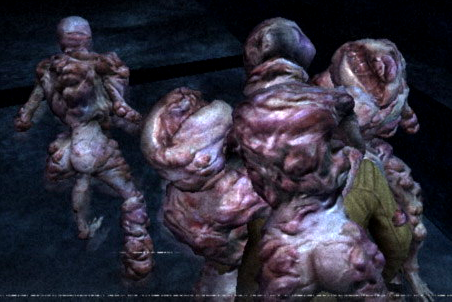 Raw Shocks are the only monsters seen in the series, thus far, to have advanced AI, which allows them to predict the player’s movements and work together in packs to hunt down Harry. The Raw Shocks are hairless, pale-skinned, humanoid creatures without facial features or distinguishing traits, save for their twitching, grotesque body language and emaciated frame. Their gender is obscure, as they bear no sexual features; however, they shriek in high-pitched, girlish voices. They can also be heard murmuring in deep undecipherable voices, such as when Harry is in hiding. As the game progresses, the Raw Shocks begin to adopt different traits according to the player’s Psych Profile. There are 4 possible traits that the Raw Shocks may adopt. By the end of the game, it is possible to have 2 or 3 traits mixed together. It should be noted that even if the Raw Shocks that appear in a game are associated with a certain ending, it does not guarantee that the player will earn that ending. These monsters are invulnerable to all damage. While Harry does not have any weapons to defend himself with, fall damage or any other types of damage has no affect on the Raw Shock. While not the first immortal enemy (Ghosts for example) they are still rare. Their skin is bloated; bubbles and a fungi-like flesh cover their skin. Overall, they appear sickly and cancerous. This trait is associated with the Drunk Dad ending, which can be obtained by focusing on alcohol and drugs, but mostly anything that involves drinking. It’s notable that their appearance is very similar to Insane Cancers from Silent Hill 3, which Heather Mason is the main protagonist of. Their limbs are turned into discs, with pieces of their body hovering in the air, giving them a sliced-like appearance. Their heads are shaped into crosses, with a circular hole in the center. Eventually, they’ll become more and more stone-like with heads resembling bricks or mountains, with rectangular protuberances coming out of their knees and shoulders. This trait is associated with the Love Lost ending, which can be obtained by being a good and caring person and focusing on finding Cheryl Mason without any distractions. The Raw Shocks are agents of repression created by Cheryl Mason’s mind. They are trying to stop Harry Mason from finding Cheryl, and are Cheryl’s attempts to keep the fantasy in her mind alive instead of accepting the truth of who her dad really was. They attack Harry by clinging to him, unwilling to let go. Eventually, towards the end of the game, the Raw Shocks overwhelm Harry and pile on top of him. However, they immediately freeze and shatter. This could be because Cheryl is beginning to accept the truth. Their petite appearance (barring the one overweight variation) can also reflect the association that children draw to being responsible for their parents divorce; in turn seeing any child-like beings in her memories as monsters that will ruin lives. 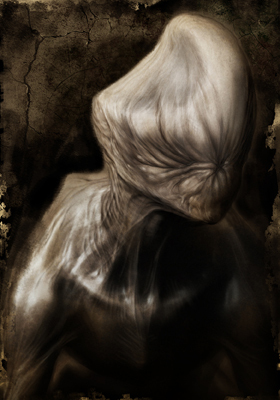 Larval Stalkers are partially visible, ghost-like entities in Silent Hill: Shattered Memories. They are harmless, but still emit static and make high-pitched sounds almost identical to those of Raw Shocks. 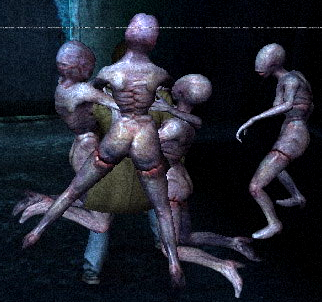 They are different than the originalLarval Stalkers in Silent Hill as they are much taller, but they will still run away when Harry shines his light on them. 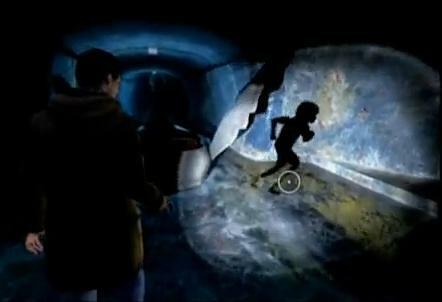 Larval Stalkers in Silent Hill: Shattered Memories serve a purpose – they can be seen following Harry Mason and/or alerting him to different things.